The opportunity: A better business operating model to gain share, create new markets and deliver value. Transform the business to realise the vision and achieve a step change in results for your customers, shareholders and people. Businesses hoping to thrive (and not just to survive) need to reinvent themselves over time as a means of coping with new, more challenging markets; in so doing they change their ways of doing business. For those who dare to envision and then realise breakthrough profitable growth, the experience offers something special: a personal and professional satisfaction beyond the power of words to describe. Achieve more: achieve a step change in performance; grow value. 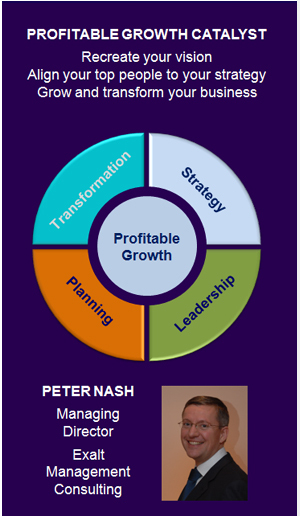 Implement the new business operating model : simplify the business and reduce costs. The vision requires changes in the business model. The new business model will build up the future business even as you run the current business, and will enable you to achieve greater results. to employees: share the benefits of profitable growth in terms of opportunity and earnings Reap the rewards: create new opportunities and renewed demand.